To love myself is the beginning of a life long romance. I like that old song, "You've gotta have heart, miles and miles of heart." A Course in Miracles teaches that love brings up anything that is not like Itself. Our task is not to seek for love, but to look within and find all the walls we've built to keep love out. Doubt, fear, worry, low self-esteem, and anger are some of the hidden blocks. Opportunities to extend love come in many guises. The goal is to keep extending love no matter what's going on. As soon as we stop extending and start defending, we've shut down the universal flow of Love. Like a pinched garden hose, our love quotient becomes a trickle, and we are the first ones to suffer. With a little willingness on our part, we can ask the Holy Spirit and the angels to help us see the situation differently. It will turn out a win/win for all. February is heart month, a good time to commit to being wholeheartedly present, no matter what's going on. Choose love over fear. Follow your heart and live passionately. With love all things are possible. Even the worse situation can be turned around with love. Sometimes harsh words are a call for love. Everything is either love or a call for love. Learn to wish that everything should come to pass exactly as it does.What? That's crazy! I thought, but over the years, I must admit, there's wisdom in it, especially when I look back and can now see how not getting some things I really thought I wanted were in my best interest. And, the situations that drove me crazy were catalysts for my biggest growth, learning more patience, love, and understanding. An important lesson I try to remember is that whatever I resist, sticks, like super glue. When I accept a situation without trying to change it, meeting it head-on (whoops...heart-on) with love (through the help of the angels and the Holy Spirit), I find a new level of freedom and joy. 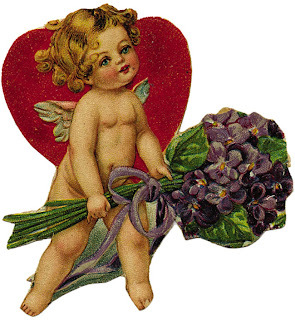 Wishing you a heartfelt Valentine's Day with your Angels who love you eternally.